In his final home game, the Frenchman saw his side thrash Burnley 5-0. Arsene Wenger was awarded Arsenal’s golden ‘Invincibles’ Premier League trophy as he bowed out of the Emirates Stadium. The 68-year-old will step down as manager at the end of the season, ending a tenure of almost 22 years. In his final home game, the Frenchman saw his side thrash Burnley 5-0 before tributes to his lengthy tenure culminated in a speech where he called on fans to back the team in his absence. The likes of Robert Pires, Sol Campbell, Freddie Ljungberg, Emmanuel Petit, William Gallas and Jens Lehmann were some of the former Arsenal players on hand to pay tribute. But it was Wenger’s former assistant Pat Rice and the club’s former goalkeeper Bob Wilson who made a speech and awarded the 68-year-old with a commemorative gold Premier League trophy – which was awarded to the club after the unbeaten ‘Invincible’ title-winning season. “He changed the face of football in this country,” Wilson said of Wenger. Once introduced Wenger, who has been keen to keep any celebrations or tributes down to a minimum, took to the microphone. He started by offering his best wishes to former adversary Sir Alex Ferguson, with the ex-Manchester United boss in intensive care after undergoing emergency surgery following a brain haemorrhage. With majority shareholder Stan Kroenke watching on, Wenger made a short speech thanking supporters for having him at the club for such a prolonged period. “Thank you for having me for such a long time, I know that is not easy but above all I am like you – I am an Arsenal fan,” he said. “That means this is more than just watching football it is a way of life, it is about caring the beautiful game, the values we cherish and something that goes through all of our bodies, through every cell of our body. “I would like to thank everyone at the club, who makes it so special. Really push to support these players, the staff who remains. “For me this group of players has a special quality, not only on the pitch but off the pitch, follow this team and support them next season because they deserve it. Wenger and his players, including Per Mertesacker, who will retire in the summer and take up a role with the Arsenal youth set-up, then embarked on a lap of honour, with the Emirates Stadium still full. 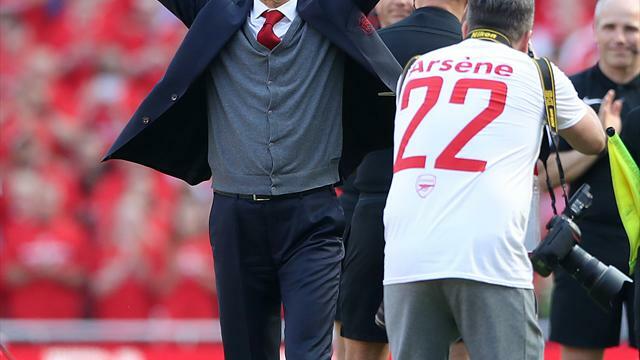 Wenger’s final season will end with no silverware and a sixth-place finish, but the supporters stayed to pay tribute to a manager who had split the Arsenal fanbase in recent years. Tributes to Wenger, whose departure at the end of the season was confirmed a fortnight ago, began on the approach to the stadium. A large banner reading “Merci Arsene” was temporarily installed outside the ground, accompanied by a list of all of the silverware delivered throughout his reign. Wenger’s last-ever Arsenal programme notes began by talking about the painful European defeat in Madrid, which confirmed his haul of major trophies with the club – three Premier League titles and seven FA Cups – would end at 10. He went on to say that his final home game would be “dominated by sadness” but thanked fans, players and backroom staff alike. Thursday’s Europa League semi-final defeat to Atletico Madrid meant there would be no fairytale ending to his reign in terms of silverware but the overall supporter reception remained positive, in spite of regular protests over the course of the past few seasons. Chants of “There’s only one Arsene Wenger” and “Arsene give us a wave” could be heard from the stands at regular intervals, while the majority of the 59,549 in attendance donned red t-shirts handed out by the club with the message ‘Merci Arsene’. Wenger’s players also delivered on the pitch, marking his final home game in style as a Pierre-Emerick Aubameyang brace and strikes from Alexandre Lacazette, Sead Kolasinac and Alex Iwobi secured an impressive victory.